More than one million incidents of fly-tipping were dealt with by councils in England in 2016-17, costing taxpayers £58 million to clear up. It was the fourth year in a row that incidents increased. 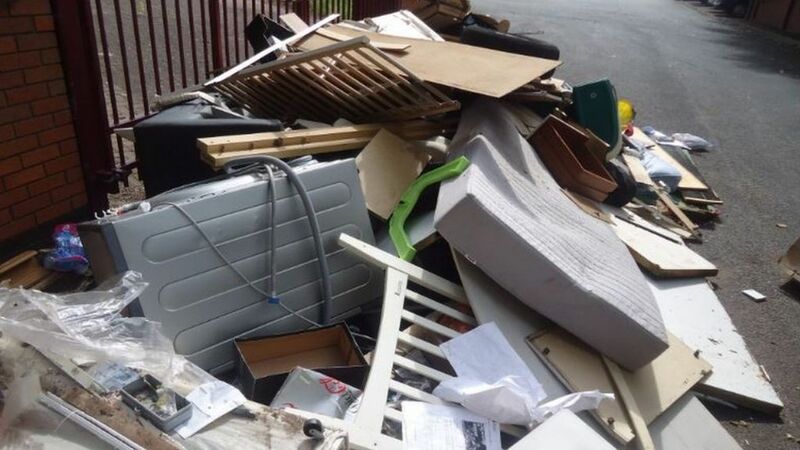 About 56,000 fixed penalty notices were handed out by councils to people caught illegally dumping. The Department for the Environment, Food and Rural Affairs (Defra) said two-thirds of fly-tipping was household waste. There were 1,002,000 cases of fly-tipping handled by councils in England between April 2016 and March 2017, equivalent to 114 every hour. The most common place for waste to be dumped was at the side of the road. Defra said two-thirds (67%) of fly-tips "involved household waste". "Total incidents involving household waste increased by 8% from 2015/16." In a report accompanying the statistics Defra said: "Many local authorities have started to improve the way they capture and report fly-tips over the past few years, so the increase over time should be interpreted with some care." The Country and Land Business Association (CLA) said it wanted to see tougher penalties imposed. Councils have the power to give people a fixed penalty of up to £400 for small-scale dumping, a power they used 56,000 times during the year. How do you stop fly-tipping and littering? The costs revealed by Defra are only those incurred by local authorities, who do not have to remove fly-tipped waste from private land. The CLA, whose members - landowners, farmers and rural businesses - face the cost of cleaning up rubbish dumped on their land, said it came to between £100m and £150m a year. Its president Ross Murray said: "Fly-tipping is not a victimless crime. Private landowners are liable for any waste dumped on their land and are fed up of clearing away other people's rubbish and paying for the privilege. If they don't act, they risk prosecution for illegal storage of waste which is simply not fair. "People would be more encouraged to do the right thing and dispose of their rubbish through proper legal channels if they have facilities available to them and see that fly-tipping fines are enforced. "However, to really combat the crime we need to see tougher penalties which act as a true deterrent. Often, it is more expensive for the victim to remove the fly-tipped waste than the fixed penalty notice to the perpetrator. Imposing and enforcing penalties which better reflect the seriousness of the crime, such as seizing vehicles used to fly-tip, is vital."